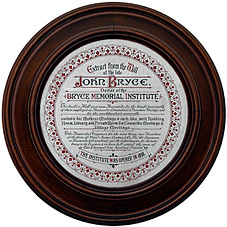 John Bryce was born in 1832. He was working in the office of Alex Cowan & Sons, Penicuik, Nr Edinburgh when James Cropper went there to learn about the making of paper. He subsequently relocated to Burneside in 1852. In 1859, John Bryce became a partner with James Cropper, George McCorquodale and William Blacklock. He married Helen Nelson White, but there was no issue. In 1875 he built Gowan Lea (now Melmore). He died in 1896, aged 64 years, having lived in Burneside for 44 years. He had planned the building of a village hall, but only made out a testament, which was not witnessed and therefore had no validity under English law. "To build a hall at or near Burneside for the benefit principally of those employed at Burneside, Cowan Head and Bowston Bridge and for the neighbourhood generally. The Burneside Clergyman for the time being, two members of the firm of James Cropper & Co Ltd and the Foremen at Burneside and Cowan Head and the Burneside Schoolmaster for the time being to be Trustees and to have full control - the sum of TWO THOUSAND FIVE HUNDRED POUNDS."